SDSU geography professor Ming-Hsiang Tsou’s method of using Twitter to track the spread of influenza is producing results. 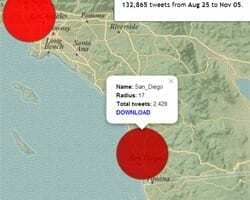 As the United States enters the sniffly, sneezy heart of flu season, a social media–monitoring program led by a San Diego State University researcher could clue in physicians and health officials to when and where severe outbreaks are occurring in real time. SDSU geography professor Ming-Hsiang Tsou, who leads the project, follows disease-related keywords that pop up on Twitter in order to identify locations where outbreaks of influenza are occurring, sometimes weeks before traditional methods can detect them. Last month, the first results from the project were published in the Journal of Medical Internet Research. Tsou’s technique might allow officials to more quickly and efficiently direct resources to outbreak zones and better contain the spread of the disease. “There is the potential to use social media to really improve the way we monitor the flu and other public health concerns,”Tsou said. The Centers for Disease Control and Prevention (CDC) defines flu season as the period from October through May, usually peaking around February. The disease normally shows up first in the western half of the country and then zooms east. The 2012-13 flu season was atypical. Health officials documented the season’s initial cases on the East Coast, and it peaked earlier than normal, in January, petering out by March. Such unpredictability makes it difficult for hospitals and regional health agencies to prepare for where and when to deploy physicians and nurses armed with vaccines and medicines. Current methods for disease-reporting involve hospitals tracking incoming patients with flu-like symptoms and forwarding those data to regional health agencies. The agencies deliver that information to the CDC, who collates it and gives national guidance on where outbreaks are occurring. It’s a relatively lengthy and costly enterprise. Tsou thought there had to be a better way. For several years, he has explored ways researchers can mine the tremendous volume of continuously updating, freely available social media content to uncover societal trends. The overarching project is called Mapping Ideas from Cyberspace to Realspace and is funded by a $1.3 million grant from the National Science Foundation. Tsou wondered, could his techniques be used to track the flu? For the recent study, he and colleagues selected 11 U.S. cities for which disease reporting was readily available and developed a computer program to monitor tweets originating from within a 17-mile radius of those cities. Whenever people tweeted the keywords “flu” or “influenza,” the program would record the username; the user’s location (and GPS coordinates, when available); the tweet’s 140-character content; time and date; whether the tweet came from a cell phone or a computer; whether it was a tweet or retweet; and if it included a link to a website. Tsou then compared his team’s data to regional reports from city and county health agencies based on the CDC’s definition of influenza-like illnesses (ILI). Nine of the 11 cities showed a statistically significant correlation between locally reported outbreaks and a higher-than-normal count of keyword-containing tweets; Tsou’s algorithm detected outbreaks earlier than local reports in five of them. The cities with the strongest correlations were San Diego, Denver, Jacksonville, Seattle and Fort Worth. March 27, 2019 - CBP announces social media tracking program FCW.comUnder a new initiative, certain Customs and Border Protection personnel are trolling public-facing social media for threats against agency facilities and officials. April 11, 2019 - Five Reasons to Care about RCMP Monitoring Your Social Media TheTyee.caYou should care, even be scared, by The Tyee's reports on the RCMP's “Project Wide Awake,” a secretive and unsupervised social media monitoring operation. February 7, 2019 - What to look for in a social media monitoring service The Business JournalsSocial media is no longer an option for small businesses; it's a necessity. April 17, 2019 - Wednesday Headlines In The Sanatoga Post The Sanatoga PostOne-click access to latest local news for April 17, 2019, in the village of Sanatoga PA, Lower Pottsgrove Township PA, Pottsgrove schools, and beyond.